has developed a business policy including all the above factors. the ethical rules of a civilized society. 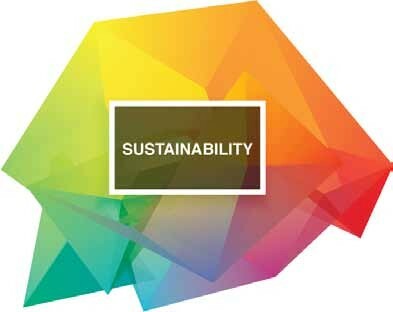 Under this spirit, great attention has been given to the sustainability of the company, the application of the generally accepted human rights, the labor conditions, its anti-corruption policy, as long as its impact on society and environment. GEM Travel counts 26 years in business and tourism sector. The company’ s rapid growth is based on good partnerships, dedicated management and respect to employees. Restless development for the company, means exact calculation of the outcomes of every business decision in order to minimize risk and sustain its position to the market. Apart from the profit, GEM Travel takes into great consideration its employees and its impact on society, and therefore sustainable business mainly means more job positions for the community and better status for the employees and their families. 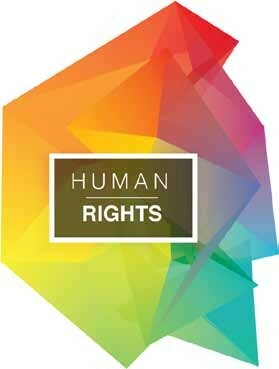 GEM Travel recognizes, understand and embodies all Human Rights instruments both in creating its policies and in day-to-day management. 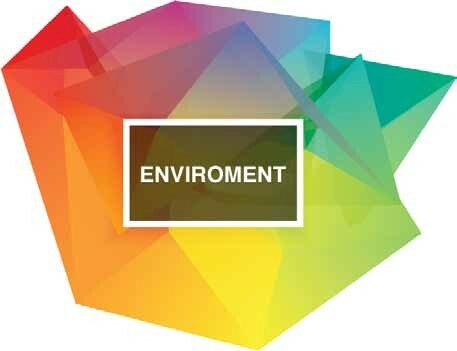 The company ensures that all its employees are provided safe, suitable and decent workplace. Harassment of any kind is explicitly prohibited in the company. Any physical, verbal, sexual or psychological abuse whether it comes from other employees, middle or high management is not tolerated. 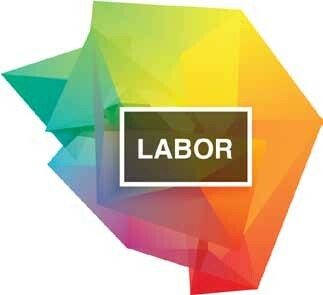 In addition, all safety measures are taken to ensure the protection of human life and health in the workplace. 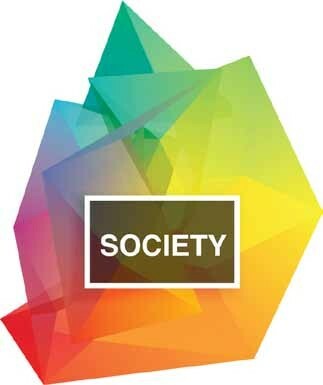 Equality in gender, sexual preferences, race and religion is another major standard of the company. GEM Travel does not take into consideration any of the above characteristics as a criterion on doing business or hiring people. The company believes that every people are equal and must have the exact same rights and opportunities regardless of biological characteristics and beliefs. Additionally, the company’ s facilities are totally accessible by people with disabilities. This does not only apply to the relations of the company with third business parties or workers but also to the treatment of its customers: The quality of service is the exact same to every one. Moreover, GEM Travel posses a special operating minibus for customers with disabilities. Eventhough the minibus has extra operational costs, they do not affect the final price for the customer, which is the same as the usual transfer. GEM Travel firmly believes that as a company, as every other business, is based on its human capital and for this reason the workers must be treated fairly and within the boundaries of the law. Following the relevant human rights obligations, GEM Travel explicitly condemns every form of forced or child labor and does not cooperate with companies that follow such tactics. About its own workers, the company’ s treatment to the employees is in accordance to the domestic and European laws. The company complies with the national minimum wage standards providing its employees with a more than decent wage and on time, social security and other bonuses. Moreover, the company’ s management ensures that every employment relation decision are based on relevant and objective criteria and with the respect to the above mentioned human rights obligations. 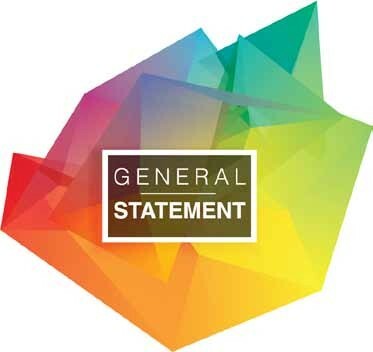 Apart from that, GEM Travel believes that every company must care for its employees’ success and personal development. For this reason, the company arranges a series of seminars for all the company’ s personnel: More specifically, a self-development experiential seminar takes place twice a year for two consecutive years about group work, social responsibility, stress management and active communication. At the same time, all the company’ s bus fleet drivers have attended a special seminar from Red Cross in order to be able to provide the first aid to the customers in case of emergency. GEM TRAVEL’ s dynamics are solely based on its positive impact on the local economy and society, equal to its business success. The company has never and will never use any illegal or unethical means to influence third parties for imposing its interests. Every type of bribery, corruption tactics, or any other means of undue influence are out of the perspective of the high management, on how business are performed. The same exists for the middle management and the other employees who are not permitted to use any of these methods in order to perform their duties. 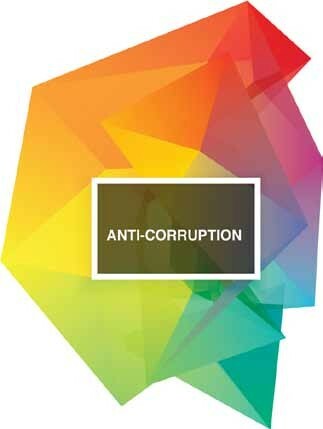 Our anti- corruption policy is applied in regard to private parties and public or judicial bodies. Recognizing its impact on society, GEM TRAVEL supports the local community in various ways: In the two years of its CSR program, the company donates large amounts of food supplies, pharmaceutical and para-pharmaceutical products to several local institutions, and also serves several local Associations and NGOs with free transportation to and from their requested destinations. First of all, in a cooperation with a recycling company, paper recycling bins have been placed in the company’ s offices in order to recycle in regular basis the used papers. Second, by adapting new informational systems in organizing the office processes (paperless technology) GEM TRAVEL managed to greatly reduce the printing needs by 1.200 sheets of paper per day. That means 1.080,00 Kg (about 1 Ton) of paper saving per year. This means that 17 trees are saved every year and 2 Tons of CO2 are not emitted. Another measure of the company was to reduce its electric consumption. Especially in the high season, the offices work for many hours which means more electric consumption, which means more CO2 emissions. Changing all the offices’ conventional lamps with LED bulbs reduced the electric consumption per hour from 8.000watt to only 1.600watt. 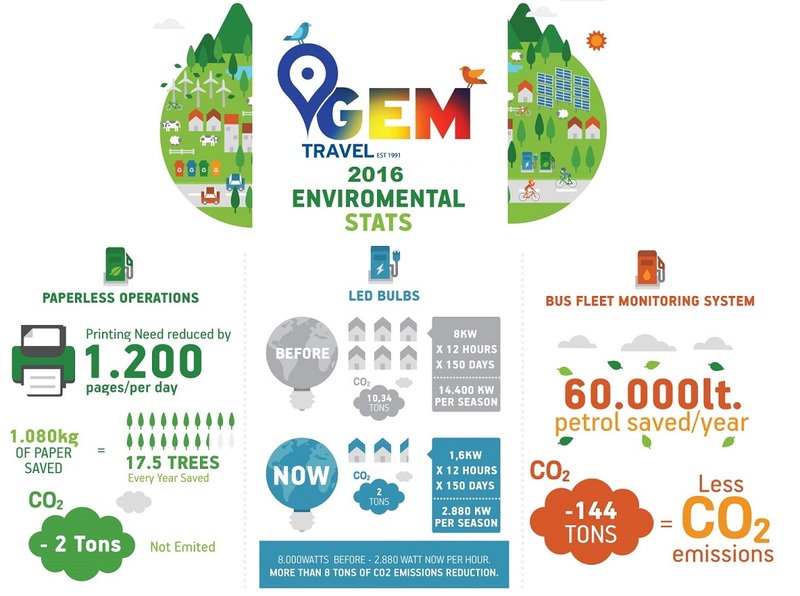 In one year perspective GEM TRAVEL managed to reduce the CO2 emissions by more than 8 Tons (the amount emitted by the electric facilities in Greece to produce that amount of energy). Another major issue was the emissions produced by the company’ s buses, given the fact that company serves lots of transfers during the summer. Thanks to a new electronic monitoring system installed to the bus fleet, the management can now successfully monitor and control their operational status, and thus save lots of petrol and energy. More specifically GEM TRAVEL succeeded to save more than 60.000 litres of petrol (without reducing the number of transfers) which equals to 144 Tons of CO2 emission saved from the environment.